Rösti is native to the Swiss-German part of Switzerland, most notably Bern, and can include bacon, herbs, onions, and spices. They are typically fried with either butter or lard. They are similar to hash browns or latkes. I spent a lot of time trying different rösti recipes, and I tried making them with both raw and parboiled grated potatoes. The raw potatoes were really hard to get crispy because it was difficult to remove all of the moisture before cooking them. The cooked and grated potatoes were wonderful, but they reminded me too much of potato cakes. What I did love about some of the rösti recipes I came across was that they called for thicker shreds of potatoes that were more "distinct." One recipe that intrigued me requires you to slice the potatoes with a mandoline and then individually cut each slice into tiny potato sticks. However, that seemed like a crazy amount of work. Enter the spiralizer! 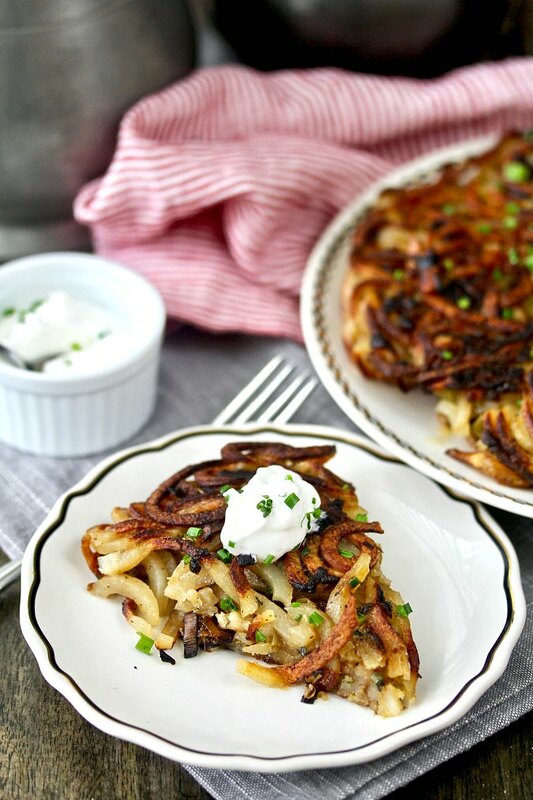 My friend Susan of The Wimpy Vegetarian made a baked rösti dish with her spiralizer and I knew I needed to follow her method. Hopefully the Swiss-German food police won't be on my case. By the way, Susan has written an amazing cookbook, The Simply Vegetarian Cookbook: Fuss-Free Recipes Everyone Will Love. Order the book! The recipes are delicious. When you get it, try the Mexican street corn salad. It's fabulous. 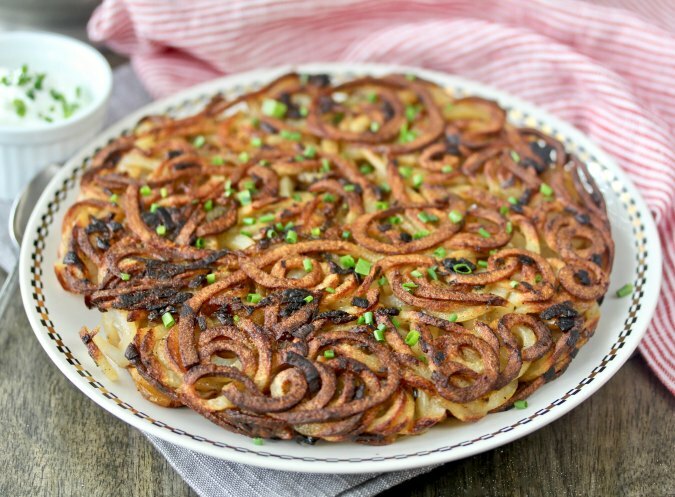 Again, I'm pretty sure the Swiss-German food police will have something to say, but using a spiralizer made making these potatoes so easy and absolutely guarantees that you won't just get a potato cake with a fancy European name. What I loved about this rösti dish was the amazing crispy crunchy outside and the tender and flavorful potatoes in the middle. The flavors of the caramelized leeks also added so much to the potatoes. How do you make baked Swiss Rösti? 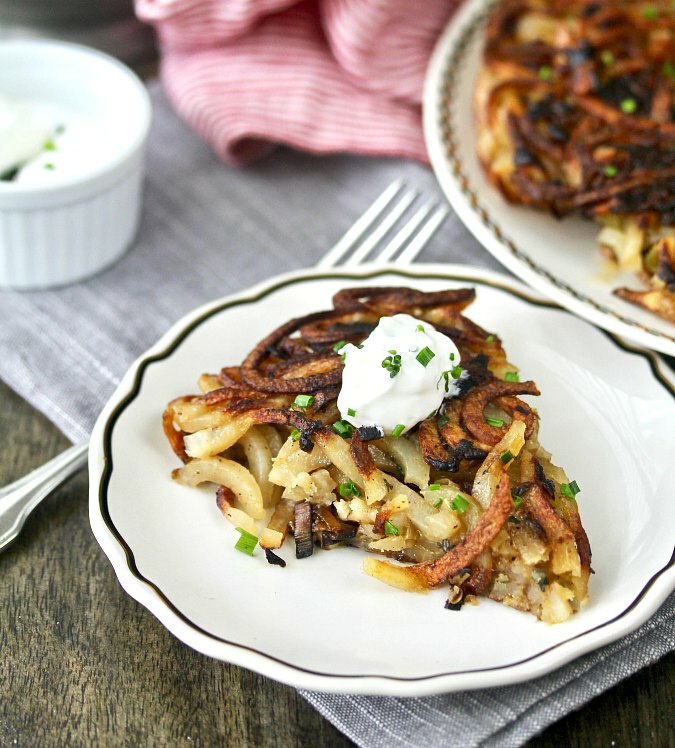 To make this rösti, you first caramelize some leeks in a large skillet, and then add the spiralized potatoes, seasonings, and a bit of milk. Cook the potato and leek mixture for about 10 minutes and then pile the mixture into a hot cake pan to bake for about 30 minutes in the lower third of your oven, and then give it quick broil on both sides to get it extra crispy. Oh man, the crispy parts!! See that little missing part on the left? That is because I couldn't stop picking at the crispy and curly crust on this rösti. A spiralizer is a contraption that pushes food through a combination slicer/grater that turns produce into long curly strands. I have two other spiralizer recipes, this spiralized sweet potato mac and cheese, and this Vietnamese zucchini and carrot salad. Both recipes are among my all time favorites. The most popular and highly rated one is this hand crank spiralizer. I had one, and it worked great with zucchini, but I really struggled making it work with the heavier veggies like potatoes. It's probably because I'm left handed and the tool is not ambidextrous. I am in love with my new KitchenAid spiralizer attachment. While America's Test Kitchen rated it lower than the hand crank model because it's too narrow to handle a large butternut squash, I am totally happy with it (affiliate link). This is assuming you already have a KitchenAid. If you don't, let me introduce to mine, in candy apple red. I seriously love it. If you just want to test spiralizing and not over commit, you can try this little hand crank version. If you don't want to get a spiralizer (I get it), and don't want to hand cut strips of potatoes, this mandoline slicer has an attachment for cutting veggies into matchsticks. I baked this rösti in a heavy duty nonstick cake pan, but you can use an 8-inch oven safe skillet as well. The trick is to heat the pan in the oven before adding the potatoes to guarantee extra crispness! You can play around with the the add-ins to the potatoes. Susan added leeks, broccolini, and smoked paprika. You could substitute onions, shallots, as well as different fresh herbs such as tarragon or rosemary. I decided to double the leeks in Susan's recipe, skip the broccolini, keep the smoked paprika, and add some fresh chopped thyme. The results were delicious. Next time, I'm trying this with some melted cheese and bacon on top. National Potato Lovers' Day is February 9th, and I'm sure you want to celebrate appropriately. After all, the much maligned potato does not get enough respect. I respect the potato! In fact, I've probably got about 50 recipes that include potatoes on this blog. Just type "potato" in the search box on the upper right, and you will be rewarded with lots recipes that include potatoes. For example, check out these Cuban Potato Balls, these Baby Yukon Gold Hasselback Potatoes, and this Japanese Potato Salad. Heat your oven to 400 degrees F, with a rack in the lower third and a rack in the upper third part of the oven. Melt 2 tablespoons of the butter in a 12 inch nonstick sauté pan. Add the leeks and cook over medium low for about 10 to 15 minutes, until the leeks are cooked through and begin to brown. Add the potatoes, and using two wooden spoons or tongs, toss the potatoes with the leeks to thoroughly combine. Add the milk, paprika, thyme, salt, and pepper, and continue to toss so that all of the ingredients are evenly distributed. Place an empty heavy duty 8 or 9 inch cake pan or oven-safe skillet in the hot oven and allow to heat for 10 minutes. Remove it from the oven and add the rest of the butter. Using a potholder, turn the pan to let the butter melt and spread over the bottom and sides of the pan. Pile the potato mixture into the pan and press it down firmly. Place the pan onto the lower rack and bake for 30 minutes, until crispy and browned on the edges. Move the pan to the upper rack, turn on the broiler, and, watching closely, brown the top of the potatoes for about 3 minutes. Remove the pan from the oven and top the pan with a plate. Invert the pan and plate, and slide the potatoes back into the pan. Broil the other side of the potatoes for another 2 to 3 minutes, watching closely, until well browned. Serve with the sour cream and chives, or garnishes of your choice such as cheese, scallions, and bacon. Leftovers can be reheated in the oven, a skillet, or toaster oven. I make a potato galette that sounds very similar. I will have to try this version. I'm so happy you tried this recipe and liked it!! I'm quite certain the Swiss-Austrian-German food police would object to the spiralizer, but it makes it sooooooo much easier. Thanks so much for including this in your roundup!!! I loved it and it was so much easier! Thanks for letting me share! I love that you used the spiralizer on this. 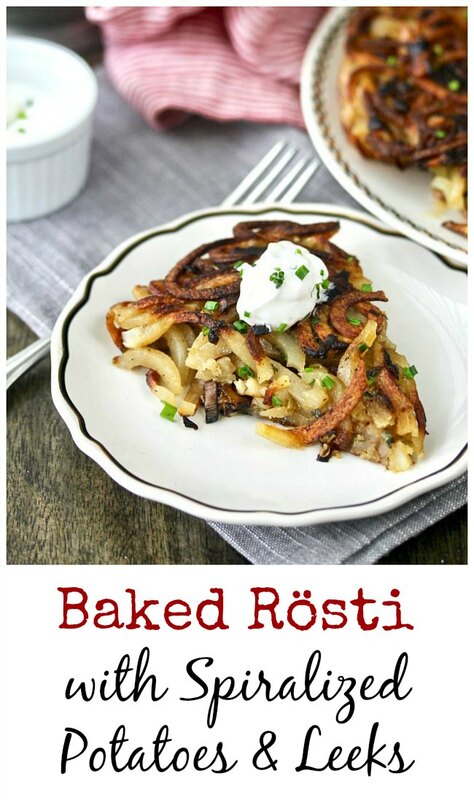 Such gorgeous rösti! This recipe has everything I like to see in a potato dish...and crunchy...oh yeah!!! 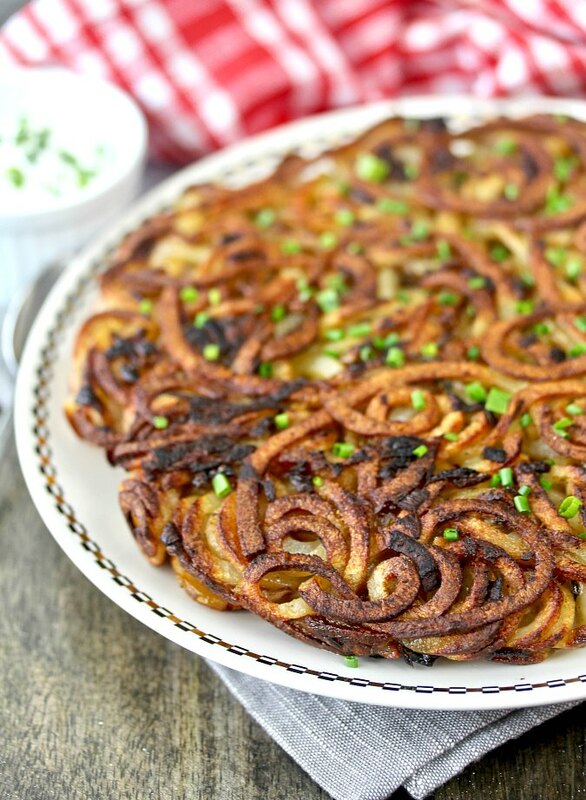 Love these spiralized potatoes, have a spiralizer yet to use it. This is definitely a must-try recipe! And you know I love to have more excuses to spiralize away! I guess I need to dig out my spiralizer! Thanks for sharing.